Inno3D has teased their upcoming iChill GeForce GTX 980 and GeForce GTX 970 graphics card which will make use of the latest Accelero Hybrid S cooler. The iChill series also introduced the HerculeZ x4 cooler based cards back during the Maxwell GM204 launch featuring a beast of a design with four independently controlled fans while the Accelero Hybrid variant will push overclocking with the new water delivery system. The Inno3D iChill GeForce GTX 980 and GeForce GTX 970 Accelero Hybrid S variants are launching at a time when several of NVIDIA’s AIB partners are also introducing their own hybrid and water cooled variants of the GeForce GTX 980 and GTX 970 graphics cards. We recently spotted the ASUS Poseidon GeForce GTx 980 and posted an article on Gigabyte’s WaterForce variants a few hours ago which are planned for launch next month in December. It looks like NVIDIA just gave the greenlight on these variants to be custom produced. Summing up the specifications quickly, the iChill GeForce GTX 980 will feature 2048 CUDA Cores, 128 texture mapping units, 64 raster operation units along with a 4 GB GDDR5 memory that operates along a 256-bit bus while the iChill GeForce GTX 970 will feature 1664 CUDA Cores, 104 texture mapping units, 64 raster operation units coupled with a 4 GB GDDR5 VRAM and a 256-bit bus. The clock frequencies of these cards are not known at the moment but Inno3D is likely to go with factory overclock since it is adequately cooled leaving much head room for overclockers. The PCB is also going to remain reference since that was the route Inno3D chose for their HerculeZ x4 variant and we can expect a similar design for the new cards. What’s new is the cooler which is supplied with a Accelero Hybrid S Black cooler (made by ARCTIC Cooling). This is obviously not the first Accelero Hybrid variant that Inno3D has introduced since they released Hybrid variants of several Kepler cards during the last two years. According to Inno3D, the card features an integrated air and liquid cooling solutin that offers all-in-one solution to deliver 200% more cooling performance. The design is simple, the shroud houses a 100mm fan and a contact base through which two pipes run into a 120mm fan radiator. The shroud will be colored black and the design scheme represents that of a sports car. There’s a large Inno3D iChill logo on the side which might lit up when the card is under operation. Inno3D didn’t give any details regarding the price but it is expected to cost a little premium over the reference models. 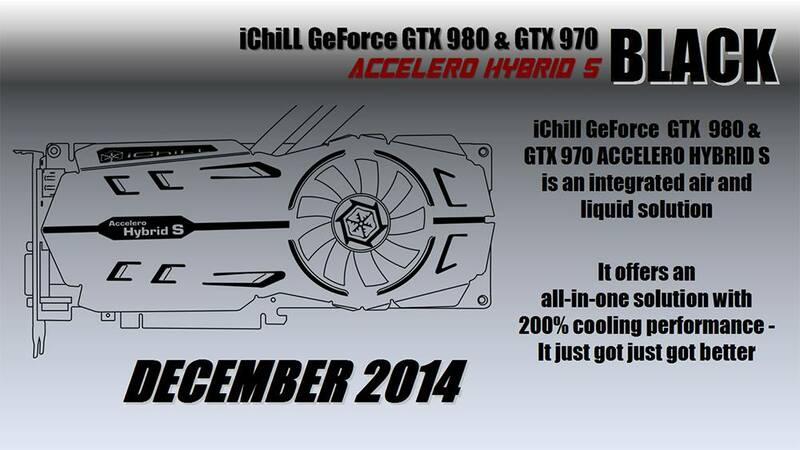 The Inno3D iChill GeForce GTX 980 and GeForce GTX 970 Accelero Hybrid S graphics card will arrive in December 2014.